Even before our container arrived at our new Sunnyvale house, I had bought an orange & a lemon tree for the terrace. Without even knowing that this was a special lemon variety I had chosen a Meyer lemon tree and went on experimenting. Easy in a place like California where ingredient choice is limitless and all my favourite things like artichokes, green asparagus & (the outside of Europe extremely rare) white asparagus, tiny potatoes, mesclun & the latest fashionable greens are at your fingertips. And so this risotto came about and it is still one of our most loved recipes & the top-of-the-heap of the lemon trials. 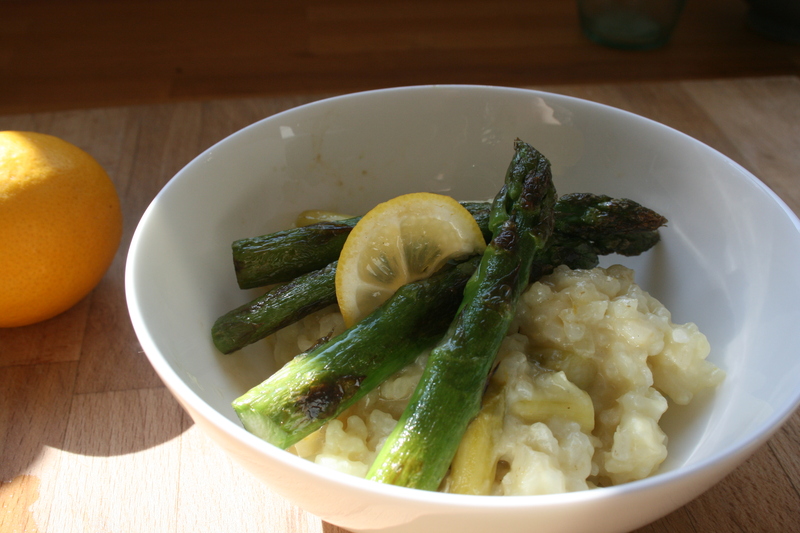 Green asparagus is incorporated in the Meyer lemony (zest & juice) risotto and the tasty tips that would fall to pieces if they were in it are seared in a pan to add another texture and flavour to the dish. Upgrade the creamy-ness with grated Parmigiano (no need to add a ton of butter) and you have a wonderful (vegetarian) supper. Add extra shavings of cheese or a few slices of Parma ham for an impressive dinner version. I might have lamented already the comparative cheapness of green asparagus in the States when faced with the gingerly harvested & accordingly priced bunches of the first local green asparagus but this risotto is sooo worth it. What do I do if I don’t have a Meyer lemon? If you can’t get Meyer lemons where you live (not that easy outside the U.S. and even the trees are hard to find in Europe), just mix the juices and the zest (separately) of both an organic lemon & organic mandarin/tangerine/clementine to get to an approximation of the warm lemony taste without the extreme sourness as I have done here, too. Bring the stock to a slow simmer and keep it this way next to the designated risotto pot. Prep the asparagus: peel the hard skin of the lower third of the asparagus spear, cut into 1.5 cm pieces until you reach the upper third with the tip and put those aside. If you have thin & thicker asparagus, cut up the thicker ones and leave the thin ones for frying. While you are cooking the risotto, slowly fry the asparagus tips or thin spears in medium hot pan with a little olive oil until browned. For the risotto melt the butter over medium heat, sweat the minced shallot until translucent then add the risotto rice. Stir for about 3 minutes or so until the rice grains show a shiny shimmer, deglaze with a generous splash of white wine and when the rice has absorbed it add a ladle of stock. Stir from time to time and add more stock each time the previous ladle has been absorbed. You might not need to use all the stock but better safe than sorry. 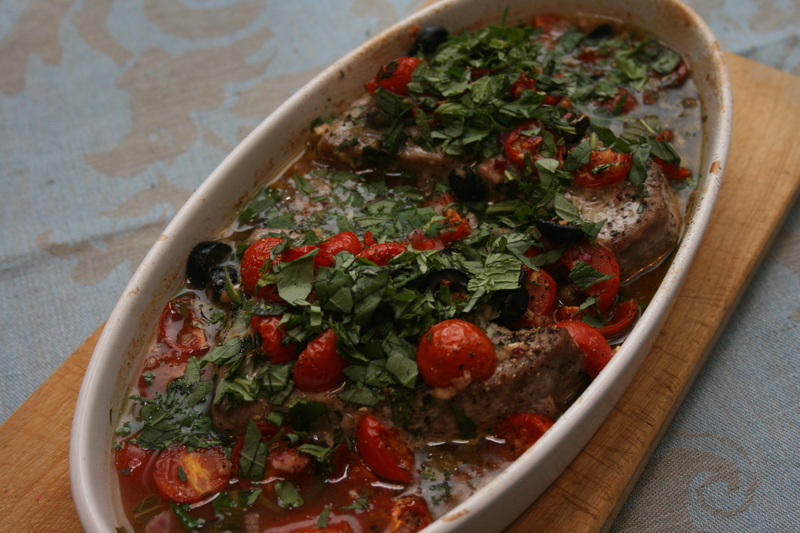 Do not let the risotto get completely dry, always add the stock when the rice still seems to be quite moist. Try the rice a few times: it should still have some bite before you add the asparagus pieces (depending on your rice this might take about 15-20 minutes). Stir in the small asparagus pieces & Meyer lemon zest and cook for another 5-7 minutes not forgetting pouring in the stock at intervals. Finally round of the risotto with the parmesan, season with Meyer lemon juice to taste (I use the whole) and possibly a little salt right before the end. Serve with the pan-fried asparagus on top. If you have a little Parma ham on your hand, add a few slices for an equally good combination & even more luxurious plate. Zuerst die Brühe zum Kochen bringen, neben dem designierten Risottotopf platzieren und auf kleiner Flamme leise weiter köcheln lassen. Dann den Spargel vorbereiten: die Enden schälen um die holzige dicke Haut zu entfernen und die Stangen bis zum obersten Drittel in 1,5 cm große Stückchen schneiden. Das Spitzenstück ganz lassen und beiseite legen. Sollte man dünne und dicke Stangen haben, dann die dünnsten ganz lassen und die dickeren aufschneiden. Während das Risotto kocht, ein wenig Olivenöl in einer Pfanne über mittlerer Hitze erwärmen und die Spargelspitzen darin rundherum langsam anbraten. Für das Risotto die Butter in einem Topf mittlerer Größe bei leichter bis mittlerer Hitze schmelzen lassen und die Schalotten darin glasig andünsten, sie sollten keine Farbe annehmen. Den Risottoreis hinzugeben und für ein paar Minuten anschwitzen bis der Reis schimmert, dann mit dem Weißwein ablöschen. Wenn beinahe die gesamte Flüssigkeit verdampft ist, eine Kelle Brühe hinzugeben. Ab und zu umrühren und immer wieder die Brühe kellenweise hinzugeben – der Reis sollte niemals trocken werden. Gelegentlich probieren und wenn der Reis noch etwas Biß hat (das dauert ca. 15-20 Minuten, kommt auf den Reis etc. an) die Spargelstückchen & die Zitronenschale unterrühren und die letzten 5-7 Minuten mitgaren. Abschließend den Parmesan hinzugeben und mit Zitronensaft & Salz abschmecken. Mit den gebratenen Spargelspitzen servieren. Falls etwas Parmaschinken zur Hand ist, passt der auch ganz wunderbar dazu. 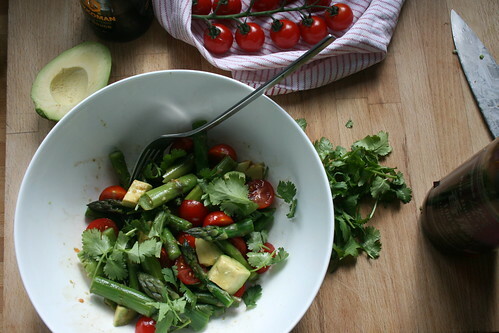 green asparagus, tomato & avocado salad, a photo by the james kitchen on Flickr. Back home. 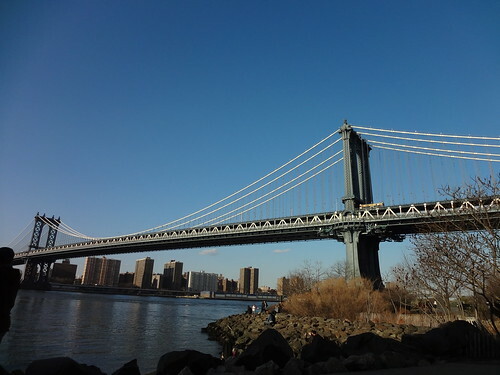 There is a smell of spring in the air, daffodils & tulips are out, magnolias are in bloom and it is cold but sunny with no icy winds (I love New York but the wind can be biting). The market stalls are filled with vernal vegetables (ups, no kale anymore) and I picked up a lovely bunch of green asparagus and some avocados to fit my most immediate need for some kind of a hangover cure. Long flights & jet lag always make me hanker for bright, savoury & tangy food with quite a bit of salt added. Where did they say, that astronauts need to have strongly seasoned food in space because the taste weakens considerably in space? Substitute high altitude for space, add a tiny bit of tiredness with a dash of hypochondria and that is me today. Well, green & fresh food is what I am after now. Don’t think I haven’t eaten very well & very healthy in the past two weeks (ignore the giant Cuban Steak sandwich or the Sturgeon bagel right before take-off). Cooking in NYC is sometimes challenging: tiny kitchen, no dishwasher, extremely limited counter space, check, check, check. On the other hand it is fun & easy since you have all the great/my favourite shops & fantastic markets with their abundance of the choicest produce and beautiful displays (oh, I missed them so so much) at your doorstep or a short subway trip away. I have a myriad of new ideas and recipes that I can’t wait to try out & experiment with. Tip: To make sure you do not get any tough asparagus pieces, I use this method of snapping the spears between my two hands until the hard fibrous bit breaks of naturally. There is a more economical method, too, which you might want to use if you had to sell a kidney to pay for the green gold (here, anyway): peel the skin of the asparagus ends if there is tough skin or you’ve got white/purple pieces to render them edible. German version at the end / Deutsches Rezept am Ende. Wash & trim the asparagus: snap off the tough ends by bending the spear between your hands until it breaks naturally or peel the hard skin off the bottom quarter if they are tough or white/purple (see tip above). Cut the green asparagus in 4-5cm or 2 inch pieces and blanch them for 5-7 minutes in generously salted water, drain and refresh in ice water. Peel the avocado and cut into chunks, halve the tomatoes & cut your spring onions on the bias into thin rhomboids. Mix the asparagus, avocado chunks and tomatoes in a bowl, sprinkle with the spring onion and coriander leaves and season with soy sauce, sesame oil and lime juice to taste. Ideally the salad should rest for a while and you need to check & adjust the seasoning again. Den Spargel waschen und putzen: eine Stange zwischen zwei Händen halten bis das holzige Ende abbricht oder wenn man es ökonomischer möchte: die harten oder auch teilweise noch weiß-violetten Enden einfach schälen. Den grünen Spargel in 4-5cm große Stückchen schneiden und in großzügig gesalzenem Wasser 5-7 Minuten kochen, dann in Eiswasser abschrecken. Die Avocado schälen und in größere Stücke zerteilen, die Tomaten halbieren und die Frühlingszwiebeln schräg in dünne Rhomben schneiden. Alles in einer Schüssel mischen, den Koriander darauf streuen und mit Sojasauce, Sesamöl und Limettensaft nach Geschmack würzen. Idealerweise sollte der Salat eine Weile ruhen & muß dann natürlich noch einmal abgeschmeckt werden. NYC, a photo by the james kitchen on Flickr. Enjoying the views, eating this (Thank God, I’ve got the recipe at home, traveled down to Brooklyn to get that super-duper dark gold dust = cocoa powder! & what a relief that the warehouse was right around the corner from this watering hole for the brownie addicts & cake afficionados – Baked) and this and this…. Doing a Lobster roll tour, yeah, all in the name of science… & Museum endurance test. Back soon. Bärlauch, wild garlic, ramsons, a photo by the james kitchen on Flickr. Since a few days we are spoilt by sunshine & blue skies, spring seems to have arrived. In my book spring starts officially when bunches of Bärlauch with its chive & garlic scented dark green leaves are turning up at the markets. Wild garlic, ramsons, Allium ursinum or in German: Bärlauch bears its name for the brown bear’s penchant for the tasty bulbs of this vegetable & herb plant. I am fond of such telling names (like last weeks Pissenlit or the lovely Meadowsweet), they provide us with a story that connects us to a time when foraging was practiced en famille, the properties and effects (and edibility) of any plant, herb & mushroom were common knowledge. Anyway, not to impress here as the master forager (which I am not, quite the opposite): stocks of wild garlic are depleted here and I am always a little afraid of picking the wrong plant by accident, although I think wild garlic and the beautiful but poisonous (!) Lily-of-the-Valley can be distinguished easily. Plus, I would feel deprived of my weekly visit to the market, having a quick chat and see what’s fresh, enticing and inspiring. Friday the first wild garlic had turned up, just in time for the weekend: This is a very light, fresh and invigorating starter to a dinner. It hardly is a real soup, more akin to a tisane (guess who’s watching Hercule Poirot at the moment) or infusion, just a little something to set the tone and entice the taste buds. Best served in small amounts either in a little bowl or cup. Update: My wild garlic soup is in the Guardian, yipee. Is a bunch a bunch? – sizes: There has arisen a question about weight or size of a or this bunch of wild garlic. Bunch sizes vary according to country, shop or stall or season or if you harvest yourself. This recipe is totally flexible and how much you use depends on your taste as well: use more for a vivid green colour & super intense wild garlic taste, less if you prefer a less in your face spring experience. The bunches I have bought this year fitted comfortably in my hand, holding the bunch like a bouquet. I weighed it, too: 173g (6.1oz) with stalks, rubber band & the occasional flower; 126g (4.4oz) just the leaves. 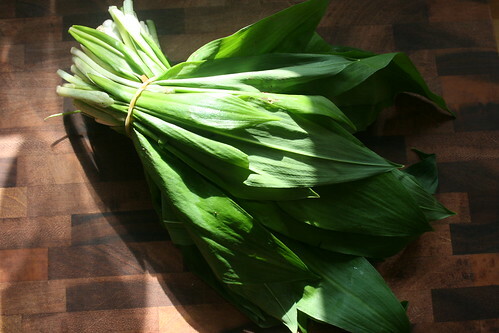 Wash and chop the wild garlic leaves. Melt the butter in a saucepan over medium heat and let the shallot turn slowly translucent. Add the chopped leaves and the stock, cook for a few minutes, then blend to a vivid green liquid. Season with salt & white pepper and add a dollop of cream. Die Bärlauchblätter waschen und hacken. In einem kleinen Topf die Butter bei mittlere Hitze schmelzen und die Schalottenwürfel glasig werden lassen. Den zerkleinerten Bärlauch sowie die Brühe hinzugeben und für ein paar Minuten köcheln lassen, dann pürieren. Das intensiv grüne Süppchen mit Salz & weißem Pfeffer abschmecken und mit einem Schuß Sahne verfeinern. In kleinen Tassen servieren. sour cherry & hazelnut biscotti, a photo by the james kitchen on Flickr. Rezept auf deutsch für Sauerkirsch & Haselnuss Biscotti s. u.
Biscotti are twice-baked and the most famous biscotti are the Tuscan cantuccini, hard almond biscotti dipped repeatedly into Vin santo or with a vero espresso in the afternoon. Spring weekends in California saw us many times driving to Half Moon Bay or Montara, wandering the empty beaches accompanied by Sanderlings and cradling a cup of coffee & ever so often dunking one of the giant biscotti picked up from the coffee shop. These sour cherry and hazelnut ones are just equally nice with a steaming cup of tea (mine’s Early Gray with milk). Just returning from a short stay in the Black Forest region proves again Germany’s fondness for dark-red Morello cherries (Schattenmorellen) as a main ingredient in the well-known Schwarzwälderkirschtorte (Black Forest Gateau). 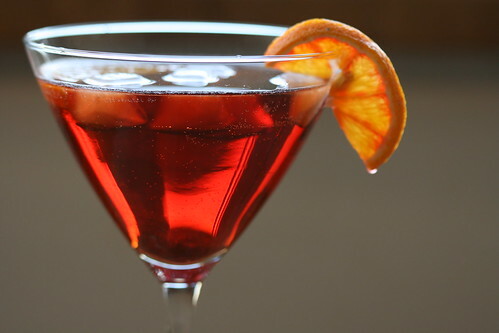 I have a special place in my heart for the less flamboyant light-red Amarelle or glas-cherries like the beautiful Cerise de Montmorency. My grandfather had a tiny tree in his garden studded with cherries shining like small light-red baubles against the dark green leaves – a picture perfect tree akin to those illustrating children’s books. They were extremely sour or so you believe as a child. Taste changes and today I savour the intense tartness & slightly old-fashioned fragrance much more as it reminds me of endless summers spent alone with my grandfather in his garden. Buying dried sour cherry varieties in Germany is nearly impossible, at least specialist shops or online dealers in dried fruits sell dried & untreated sour cherries. 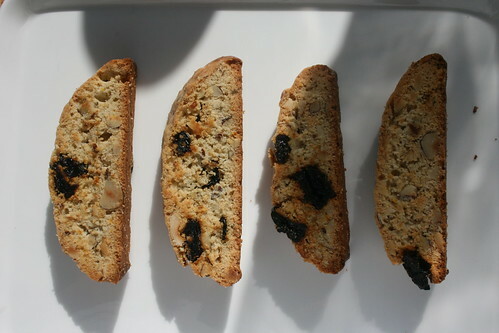 For these biscotti though I have used my last bag of dried Montmorency cherries brought back from the US (Trader Joe’s, Whole Food Market) before I stock up our larder again like a greedy magpie. Preheat the oven to 175°C or 350° F, line one or two baking trays with a sheet of baking parchment. Roast the hazelnuts in a dry pan or the oven until they small intensely nutty but are not browned too much. Cool briefly, then chop into coarse pieces, leaving a few rather large chunks or give the nuts a quick blitz in the food processor. Cream butter and sugar until light yellow and fluffy. Add one egg after the other and the vanilla extract. Sift flour, baking powder, cinnamon & salt together, slowly stir a small amount into the batter at first before you add the rest. Mix with orange zest, hazelnuts and cherries and spoon the soft dough with a spatula onto the baking tray and form two logs (flouring your hands helps to prevent the dough from sticking) with at least 20 cm space in between. Bake for about 25-30 minutes until lightly golden but not brown. Take them out of the oven and leave to cool on the tray for about 15 minutes, then cut the logs with a serrated knife diagonally into 2cm slices and return those to the baking tray (lying on one side) to be baked for another 10 minutes until the biscotti look lightly toasted. Leave to cool on the trays, keep in airtight containers. Backofen auf 175°C vorheizen und ein Backblech mit Backpapier belegen. Die Haselnüsse entweder in einer trockenen Pfanne kurz rösten oder im Backofen toasten bis sie intensiv nussig riechen, aber nicht sehr braun geworden sind. Abkühlen lassen und entweder mit dem Messer grob hacken oder in der Küchenmaschine zerkleinern. Es sollten noch ein paar größere Stückchen darunter sein, die man auch noch in den gebackenen Biscotti sehen kann. Die Butter mit dem Zucker schaumig schlagen und die Eier nach und nach, anschließend den Vanilleextrakt hinzugeben. Das Mehl zusammen mit Backpulver, Zimt und Salz sieben, zuerst einen kleinen Teil langsam unterrühren, schließlich das gesamte Mehl. Zum Schluß die Orangenschale, die grob gehackten Haselnüsse und die Sauerkirschen unterheben. Die weiche Masse auf das Backblech mit dem Teigschaber geben und mit bemehlten Händen zu zwei langen Rollen formen, etwas plattdrücken. Beide Teigrollen sollten mindestens 20cm Abstand voneinander haben. Für ca. 25-30 Minuten backen bis sie goldfarben (nicht braun) sind, auf dem Blech für 15 Minuten abkühlen lassen. Mit einem Brotmesser diagonal in 2cm breite Scheiben schneiden, diese auf der flachen Seite auf das Backblech legen und wiederum für 10 Minuten backen bis diese goldfarben getoastet sind. Auf dem Blech abkühlen lassen, in luftdichtem Container aufbewahren.